Browse herbal-products suppliers by country and region. Short on time? Let herbal-products sellers contact you. 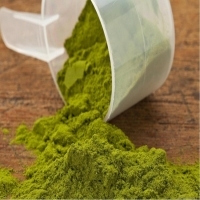 Moringa leaf powder contains unique constituents that include 92 nutrients essential for body health. Its leaves have been used in cooking during ancient times itself. Increased longevity has been proven in countries such as India and Philippines. Various parts this tree have been used for medicinal purposes in alternative medicinal systems. Dawnmoringa follows strict quality control in production of leaf powder and ensures that your order is processed with minimum time. We offer leaf powder at wholesale prices and our product meets industry standards due to strict quality control measures. 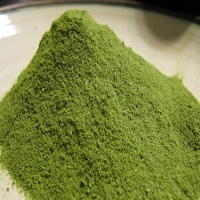 Moringa Leaf Powder Properties It has been found to be useful for : 1. Anti-aging 2. weight loss 3. supports digestion 4. protecting eye , bone health , cell structure 5. improve immunity and body metabolism 6. detox effect Moringa powder is made from the freshly harvested leaves of the Moringa oleifera tree. 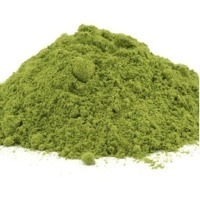 Fresh Moringa powder has a deep green color and a rich nutty smell. 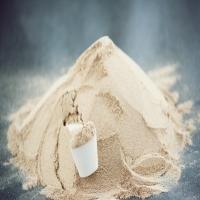 The nutrient-packed powder is soft and fluffy when it is pure and grown in organic conditions. It dissolves easily into water or juice and is an excellent ingredient in a variety of healthy recipes. These beneficial changes are due to the unique and complex blend of nutrients that are only found in the Moringa oleifera tree. The balance of powerful antioxidants, vitamins, minerals, and complete proteins deliver a potent boost of energy and increase the body's functioning in many ways. Moringa leaves, in fresh or powdered form, can be added to salads, cooked like spinach or other steamed vegetables, or included in soups, curries, and gravies. 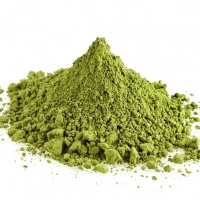 The leaf powder retains a deep green consistency when fresh - a good sign also that your Moringa leaf powder is of a high quality. Cassia seed is the ripe seed of the annual plant Cassia obtusifolia Linn., or Cassia tora Linn., of the Leguminosae/Fabaceae family. The plant is native to the tropics. It grows wild in India. This is an upright plant with compound leaves in groupings of six. Bears 20-cm pods which contain many cylindrical seeds. In addition to being used as medicinal herbs, the seeds are also used as a mordant in dyeing. They can also be roasted and ground, used as a coffee substitute. The seeds of Cassia tora L. have been conventionally used throughout the Asian region for several centuries. Its roasted seeds have a favorable flavor, so it is used popularly as a tea in Korea. Cassia tora L. has been also prescribed in oriental herb medicine to treat night blindness, hypertension, hypercholesterolemia, and constipation The seeds of Cassia Tora are rhombohedral and brown in color, about 30 to 50 in number. The plant bears flowers in the rainy season and fruits in the winter. Application of Cassia Tora Seed Making Cassia tora tea. Cassia Tora is used as a coffee substitute and has a maturing and anodyne action. It is very useful in treating skin diseases like ringworm and itching or body scratch and psoriasis. Decoction of the fruit of Cassia Tora is used in the treatment of fever. It is consumed in worm infestation and cures the infection occurring in the body. Cassia Tora acts as a liver stimulant, mild laxative and heart tonic. The herb helps the body in maintaining the normal level of cholesterol. Its paste is used for treating skin ailments and also for getting rid of chronic diseases. Cassia Tora proves worthwhile in treating piles and hemorrhoids as well as relieving the pain caused on excretion. Its powder proves useful in combating indigestion, toning up heart muscles and purifying blood. The juice extracted from its leaves is used in case of skin ailments, rashes and allergies. It is also used as an antidote in case of various poisonings. 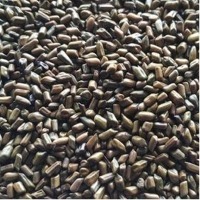 Common Names of Psyllium: Psyllium Husk Powder, Flea, lspaghua, Spogel, Plantago Psyllium, Isaphgol, Plantago sp., Isabgula, Plantaginis Ovatae Testa We Offers Psyllium husk in all different grades from Psyllium85%, 90%, 95%, 98%, 99% grades. 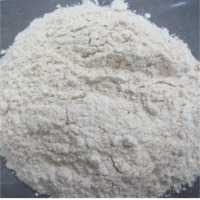 We can offer Psyllium husk in whole as well as powder from mesh size of 20-80 mesh. The husk of Psyllium is the actual coating of mucilage around the seed. It is considered pure dietary fiber and is the only part of the plant used in manufacturing Psyllium products. 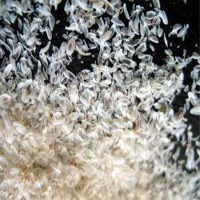 Psyllium Husk is separated from the seeds by a mechanical process where no Chemicals are used. Psyllium Husk is available mostly in four grade of purity i.e. 99% pure, 98% pure, 95% pure, 90% Pure and 85% pure. 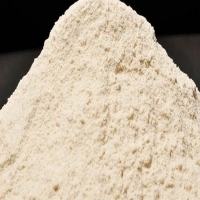 Psyllium Husk Powder is processed from the Psyllium Husk which is grinded using Pulverize Machine in various particle sizes that is 40 meshes, 60 meshes, 80 meshes, 100 meshes in all grades of purity. Psyllium Husk and its Powder are used as a mild laxative spread in the United States and other European countries. 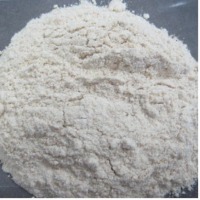 Psyllium Husk Powder has high fiber and recently it has been started getting used in low carbohydrate treatment in USA. 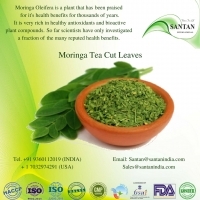 Organic Moringa Tea Cut Leaves We offer superior quality organic moringa leaves which are 100% organic. The leaves are derived from the plants cultivated in organic method and possess high nutritional values. 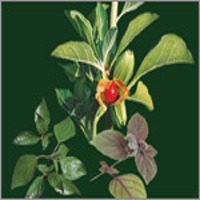 The leaves are used for making leaf powder that in turn increases the natural defense of body. Also these dried leaves are mainly used for making tea. Specialties Green, natural with aroma No additives and NON GMO Rich in vitamins, phyto nutrients, antioxidants, amino acids Germ free technology Sterile packing Benefits Lowers Blood Pressure Acts as a Sleep Aid - For a good night?s rest. Boost Energy - A single serving of moringa has almost all nutrition. High in Fiber - Moringa is high in fiber, Also a key component in maintaining a healthy cardiovascular system. Controls Diabetes - It is extremely beneficial for diabetic patients. 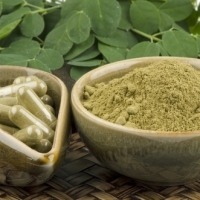 Moringa Oliefera capsules or a drink made from moringa powder can be consumed for keeping the level of sugar normal. Anti-Oxidant - Moringa powder is rich in catechin polyphenols, particularly epigallocatechin gallate (EGCG) that is a powerful antioxidant. Detoxifies - It is often used to purify water due to its detoxifying effects. Being a coagulant agent, it can attach itself to hazardous bacteria and other agents. Improves Immunity Delays Ageing Process - It is an excellent source of antioxidants with high contents of vitamin A, vitamin C, vitamin E and bioflavonoids. Active oxygen radicals cause skin diseases by stealing electrons from normal healthy biological molecules. These nutrients help to block the oxidation of healthy tissue by active oxygen, thus delaying the aging process and lowering the appearance of fine lines and wrinkles. Aids In Keratin Formation - Certain vitamins, minerals and amino acids contained in moringa powder support the metabolic pathways involved in the formation of keratin protein, which is vital for healthy hair. It also contains the amino acid Methionine that supplies sulphur to your hair, thus preventing hair loss. Stimulates Hair Growth - Moringa leaf powder also contains zinc, which stimulates hair growth by enhancing the immune system. Zinc deficiency can result in atrophy of hair follicles due to impairment of DNA and protein synthesis. Specialties Green, natural with aroma No additives and NON GMO Rich in digestive stimulant, laxative, appetite suppressant, and diuretic. Germ free technology Sterile packing Benefits Gymnema "destroyer of sugar." Gymnema is a woody climbing shrub native to India and Africa. The leaves are used to make medicine. 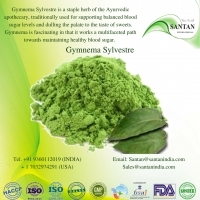 Gymnema has a long history of use in India?s Ayurvedic medicine. The Hindi name, gurmar, means "destroyer of sugar." 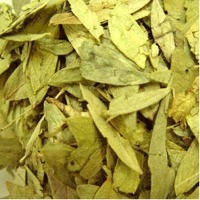 Today, gymnema is used for diabetes, metabolic syndrome, weight loss, and cough. It is also used for malaria and as a snake bite antidote, digestive stimulant, laxative, appetite suppressant, and diuretic. How does it work. Gymnema contains substances that decrease the absorption of sugar from the intestine. Gymnema may also increase the amount of insulin in the body and increase the growth of cells in the pancreas, which is the place in the body where insulin is made. The Moringa Fruit Powder is very rich in Nutrients. Regular intake of Moringa Fruit powder as a natural supplement will help to maintain the nutritional profile of the body. It has good fiber content. How we process it Matured Moringa Fruits are sorted, cut in to small pieces and shadow dried. Moringa fruit is grinded to get the powder. This powder is then sieved and packed. 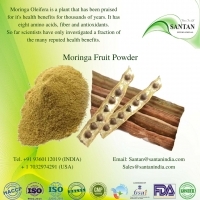 Benefits Moringa friut powder boost stamina It acts like anti-oxidant Improves Immunity Provides nutrients to hair follicles Moringa has high in fiber, also a key component in maintaining a healthy cardiovascular system. 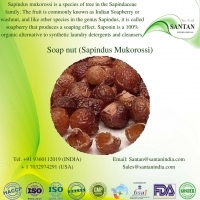 Specialties Natural with aroma No additives and NON GMO Rich in saponin, a natural detergent Naturally grown Germ free technology Benefits The soap nut comes from the Soapnut Tree (Sapindus mukorossi). The trees produce the small black berry. The shells used for detergent contain something called saponin, which works as a natural surfactant. Sustainable: It's a renewable resource, easily grown organically. All Natural: No funky or harmful ingredients. Eco-Friendly: Less processing, less energy and less packaging. Affordable: They can replace multiple cleaners, and last longer. Reusable: Each berry can be used up to 6 times before it's spent. Hypoallergenic: No skin or respiratory irritation and non-toxic. Not Actually Nuts: They're totally safe for those with nut allergies. Simple: Throw them in your wash or make a simple liquid detergent. Odorless: But you can always add your own essential oils. Gentle: Their mild nature won't damage delicate clothing or surfaces. No Fabric Softener: They naturally soften your fabrics! Save Water: They rinse easier so require less water. Save Energy: You can use a shorter rinse cycle in your laundry, too. Countless Uses: Look below for a few ideas on how to use soap nuts in your own home. 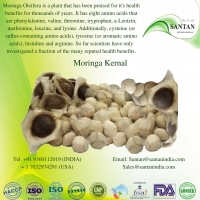 Moringa Kernel used mainly for the moringa oil extraction. Moringa seed kernel used for water purification. Drum stick kernels also used as the mast cell stabilizer and natural anti-inflammatory food. It also has medical evidence that the moringa oleifera has some therapeutic and prophylactic properties. Moringa kernels used to extract moringa oil. Moringa oil called as the ben oil. Ben oil used for different skin disease around the world Moringa kernel used as a natural flocculant. Turbid water becomes clear water using moringa kernel powder. Specialties Natural with aroma No additives and NON GMO Rich in vitamins, phyto nutrients, antioxidants, amino acids , Behenic fatty acids, and has antihepatotoxicity Germ free technology Sterile packing? 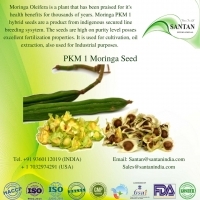 Moringa PKM1 Hybrid Seeds are a product from indigenous secured line breeding system. 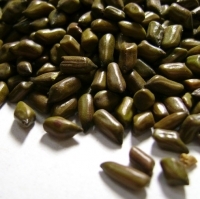 The seeds are high on purity level and possess excellent fertilization properties. It is used for cultivation, oil extraction, also used for industrial purposes. These seeds are rich in oil content and are available in different grades which is mainly used as antibiotics and are anti- inflammatory. Specialties Natural with aroma No additives and NON GMO Rich in vitamins, phyto nutrients, antioxidants, amino acids , Behenic fatty acids, and has antihepatotoxicity Germ free technology Sterile packing Benefits A seed contains almost 30 antioxidants. Good for skin and hair.